Schoolchildren who witnessed the brutal murder of Jim Donegan could be at risk of developing post traumatic stress disorder (PTSD), a child counselling expert has said. 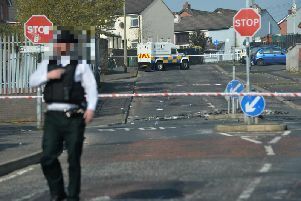 Hundreds of children and young people were in the vicinity of St Mary’s Christian Brothers’ Grammar School on Belfast’s Glen Road on Tuesday afternoon when a gunman approached the father-of-three and opened fire. Jim Donegan was shot dead outside a school in west Belfast on Tuesday afternoon. The 43-year-old, who was sat in his Porsche sports car waiting to collect his 13-year-old son, was shot several times and died at the scene. Teachers used coats to cover the windscreen of the car in a bid to try to shield pupils from the horrific scene, but many have been left traumatised after witnessing the shooting. The school was closed on Wednesday, but reopened yesterday and pupils have been offered counselling. London-based Stacey Hart, a trauma specialist with the charity Grief Encounter (www.griefencounter.org.uk), has considerable experience working with young people who have been affected by murders and shootings. Stacey Hart, trauma specialist with the charity Grief Encounter. She welcomed the fact that the school is offering pupils counselling, but urged parents to look out for the signs and symptoms of serious psychological trauma. “Obviously it is at the forefront of everyone’s mind now and will be for the next few days, but as the weeks go on you have to watch for children displaying anxious behaviours – panicking, not sleeping and changes in personality,” Stacey said. “Parents need to keep the conversations open about what happened and look out for changes in behaviour. It’s also really important that they model good behaviour – it’s okay to be upset and feel emotional. It’s important that the kids know they don’t have to hold things in. Stacey, a member of the British Association for Counselling and Psychotherapy, said witnessing such a horrific incident could have “a huge psychological impact” and said some of the children could be at risk of developing PTSD. “Signs would usually include high anxiety levels, not sleeping, nightmares and flashbacks, so I think it’s really important that parents look out for this and seek counselling if their children are displaying such symptoms,” she added. In a family notice they said he will be “always remembered”. Two men aged 49 and 51 who were arrested in west Belfast on Wednesday by officers investigating the murder have been “released unconditionally”, the PSNI said.